"According to Wealth-X estimates of global private wealth, the number of individuals with net assets of more than $1million totaled 22.3 million in 2017, with a combined net worth of $91.7 trillion. A breakdown by tier shows not only the considerable share of wealth held by the small cohort of UHNW individuals, but also that the ultra wealthy experienced faster growth in net worth than each of the three lower tiers. Almost 90% of all millionaires had a net worth of between $1m and $5m, with this group of 19.6 million individuals holding a 40% share of global millionaire wealth. Exclusivity rises significantly above the $5m threshold, as does average net worth. For example, those individuals with net assets of between $10m and $30m – the closest to attaining UHNW status – held 14% of global millionaire wealth, while accounting for a 3.6% share of the population. Rising higher still, the global ultra wealthy population accounted for just 1.2% of the world’s millionaires but held 34% of the collective wealth. Whereas population growth rates across the different wealth tiers were very similar in 2017, an increase of 16.3% in total UHNW wealth significantly outpaced the average rise of around 12.7% in each of the other three tiers." Wealth-X report ranks Pakistan 9th in terms of ultra-rich individuals' growth while Bangladesh is ranked first and India ranked 5th. The relatively slower growth of ultra-rich in Pakistan is supported by other wealth reports as well. For example, data released by Credit Suisse with its Global Wealth Report 2017 shows that Pakistan is the most egalitarian nation in South Asia. It also confirms that the median wealth of Pakistani households is three times higher than that of households in India. Growing household wealth in developing nations like India and Pakistan is reflected in ownership of consumer durables like computers, home appliances and vehicles. 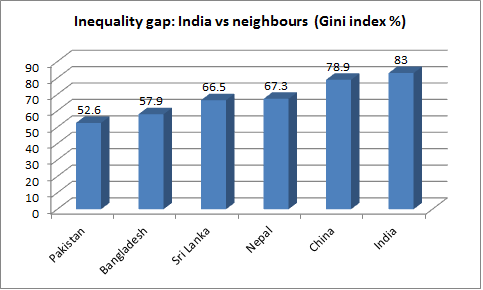 This data is sourced from periodic household surveys like NSS (National Sampling Survey) in India and PSLM (Pakistan Social and Living Standards Measurement) in Pakistan. 1. As of 2015, car ownership in both India and Pakistan is about the same at 6% of households owning a car. However, 41% of Pakistani household own motorcycles, several points higher than India's 32%. 2. 12% of Pakistani households own a computer, slightly higher than 11% in India. 3. Higher percentage of Pakistani households own appliances such as refrigerators (Pakistan 47%, India 33%), washing machines (Pakistan 48%, India 15%) and fans (Pakistan 91%, India 83%). 4. 71% of Indian households own televisions versus 62% in Pakistan. 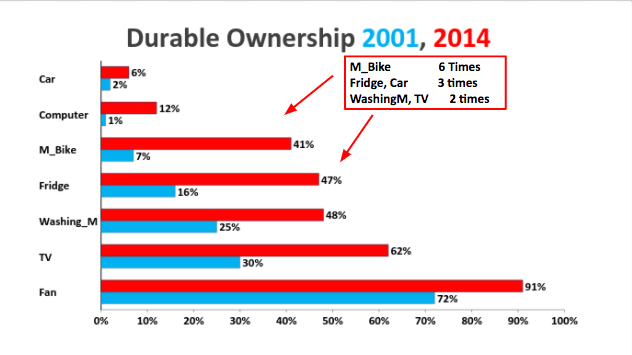 Dr. Abdul Ghani has also analyzed household data to show that the percentage of Pakistani households owning washing machines has doubled while car and refrigerator ownership has tripled and motorcycle ownership jumped 6-fold from 2001 to 2014. Rising ownership of durables in Pakistan has been driven by significant reduction in poverty and growth of household incomes, according to Dr. Abdul Ghani's research. Percentage of households with per capita income of under $2 per day per person has plummeted from 57% in 2001 to 7% in 2014. 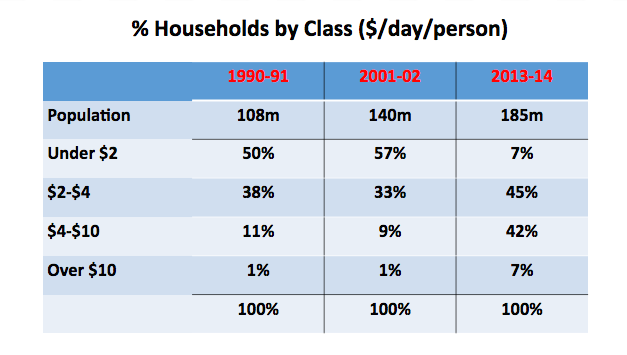 At the same time, the percentage of households earning $2 to $10 per day per person has soared from 42% of households in 2001 to 87% of households in 2014. The percentage of those earning over $10 per day per person has jumped 7-fold from 1% of households in 2001 to 7% of households in 2014. Pakistan is among the countries with top 10 fastest growing population of ultra-high net-worth (UHNW) individuals over the last 5 years. 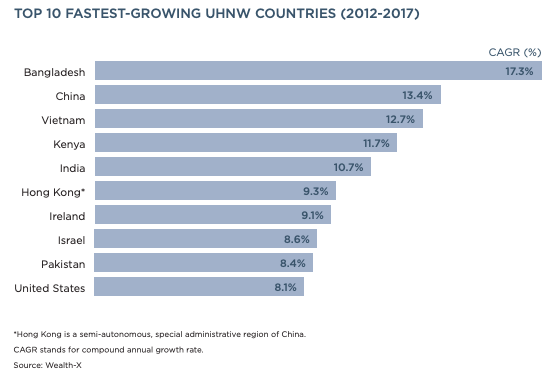 Bangladesh with 17.3% UHNW growth tops the list followed by China (13.4%), Vietnam (12.7%), Kenya (11.7%), India (10.7%), Hong Kong (9.3%), Ireland (9.1%), Israel (8.6%), Pakistan (8.4%) and United States (8.1%), according to World Ultra Wealth Report 2018. Credit Suisse wealth data for 2017 shows that Pakistan has the lowest wealth inequality in its region as measured by Gini index. Lower inequality can be seen in terms of rising percentage of households that can afford to buy durables like appliances and vehicles as reported by Dr. Abdul Ghani of Karachi School of Business and Leadership (KSBL).